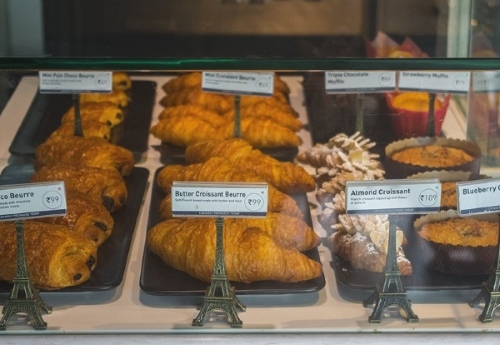 Paris is the Mecca for lovers of bakery products, but with the opening of Délifrance devotees in Delhi don’t need to invest in flight tickets to experience a slice of heaven. Délifrance is over 25 years old and its outlets are present in more than 50 countries. Brought to India by Gamma Pizzakraft Pvt. Ltd., the chain stays true to its roots by directly sourcing their ingredients from France. Two items on its menu are even entirely flown down to be sold at their new store at Cyber Hub, Gurgaon! This morning the staff at Délifrance started me off with a Tuna Mayonnaise Croissant and a butter croissant. Both were fresh and delicious. The butter croissant was possibly the softest croissant I have ever eaten. 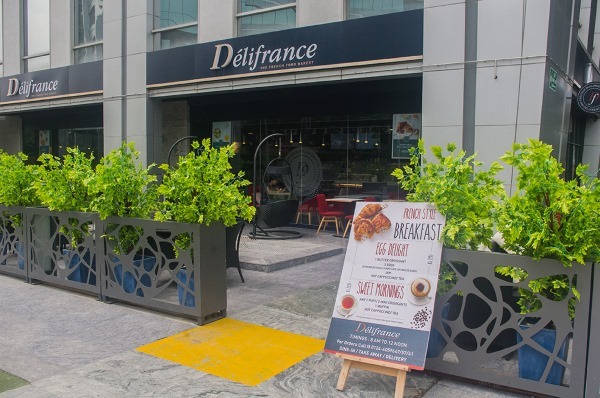 Délifrance bakes their breads daily, using ingredients flown from Paris, from the brand’s parent company Grands Moulins de Paris, a French milling company. Tuna Mayonnaise Croissant at the foreground; Butter Croissants at the background. Their coffee is a blend of Columbian beans and I tried a Cappuccino with Irish cream flavour. It tasted divine and I cannot think of any coffee I like more in all of Delhi NCR. I moved on to their Pesto fusilli pasta, which had a wonderful balance of basil, pine nuts and garlic. 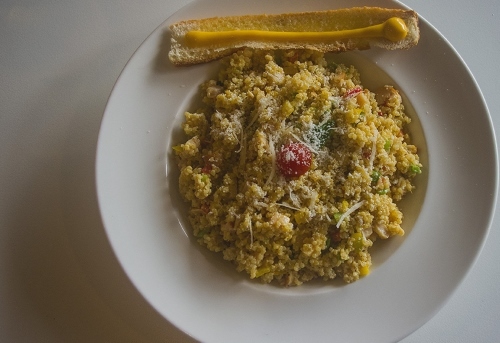 The healthy Quinoa salad came next, which was light and felt very fresh. They surely seem to be paying attention to the freshness of their ingredients. Their juices too are freshly squeezed and not loaded with artificial sugar. The tanginess of their sweet lime, the authentic flavour of watermelon, are all a refreshing alternative to the usual sugar-loaded fresh juices served in most places. 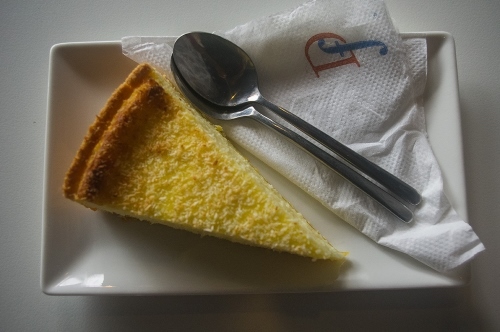 Their pièce de résistance came in the form of Flan Coco, flown in a frozen state to Delhi all the way from Paris. As expected, it was authentic, easy on the sugar, with a light flavour of coconut. 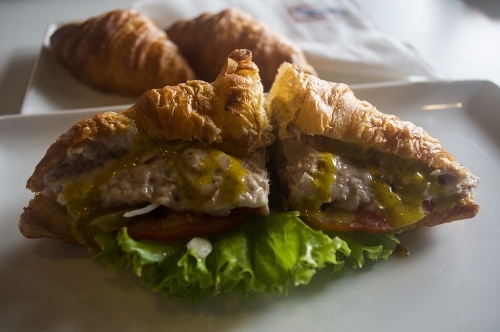 Their fruit croissant comes stuffed with custard and is topped with fruits. It was among my personal favourites of the day. 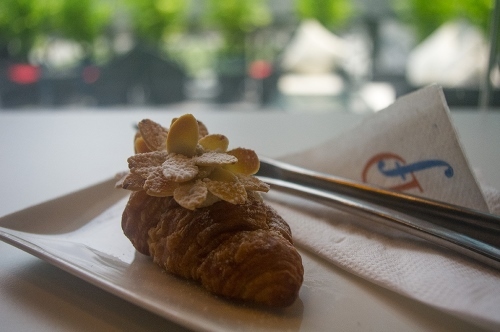 Their almond croissant is quite a looker, decorated as it is with a bouquet of crispy almond flakes. Before being invited for this review I had noticed Délifrance and walked in for some sandwich and coffee. I remember enjoying the food, and even more so the plain cappuccino. The service is perhaps the only aspect this outlet should consider improving. I remember standing in the queue for nearly ten minutes before I was able to place my order. On both visits I felt the staff is not as attentive as one would want from a premium delicatessen. I found my slice of heaven here, on a lovely rainy Sunday morning, and I will go there every time my soul calls out for a break and a little indulgence! Tagged Food & Drinks, Food review, LifeSpice, The Good Life. Bookmark the permalink.